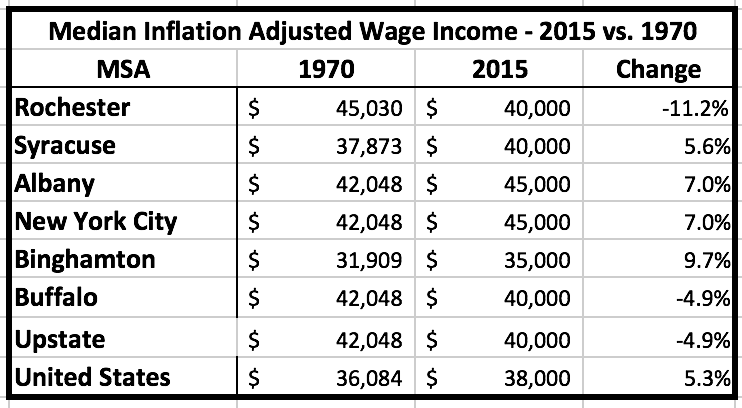 Since 1970, inflation adjusted wage income growth has been almost nonexistent – only five percent over the 45 year period ending in 2015. Income change in metropolitan areas in New York State has differed little from the nation. Rochester and Buffalo were two exceptions – both had lower median real wage incomes in 2015 than in 1970. Because of the declines in upstate’s two largest metropolitan areas, upstate real wage incomes overall were 5% lower in 2015 than they were in 1970. In a second post, I examined the gap in real wage incomes between black and white residents and found that the gap had not decreased over the 45 year period. In fact, in upstate metropolitan areas, the gap was somewhat larger in 2015 than it was in 1970. This post examines changes in inflation adjusted wage income as they affect men and women in New York State and the nation. While real wages have been relatively stable since 1970, wage incomes for men, particularly younger men with high school educations or less, have shown sharp declines, while those of women have substantially increased. Nevertheless, a wage gap between the sexes remains. Data, as in my earlier posts, is from Public Use Microdata samples made available by the U. S. Census Bureau (Steven Ruggles, Katie Genadek, Ronald Goeken, Josiah Grover, and Matthew Sobek. Integrated Public Use Microdata Series: Version 6.0 [dataset]. Minneapolis: University of Minnesota, 2015. http://doi.org/10.18128/D010.V6.0) Public Use Microdata Sample files (PUMS) are a sample of the responses to the American Community Survey and the Decennial Census and include most population and housing characteristics. Because the data is from samples of households in metropolitan areas, sampling error is possible, particularly for smaller metropolitan areas. 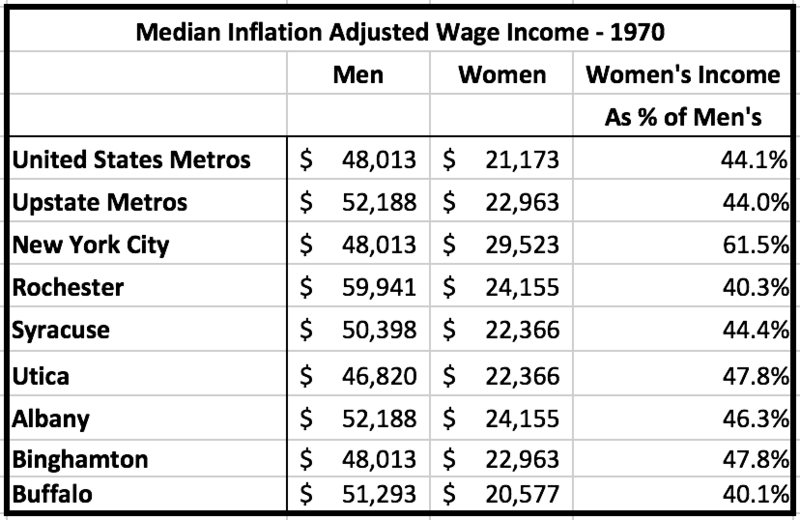 In 1970, real wage incomes of men were substantially higher than those of women. In upstate metropolitan areas, women’s median wage incomes averaged between 40% and 50% of those of men. 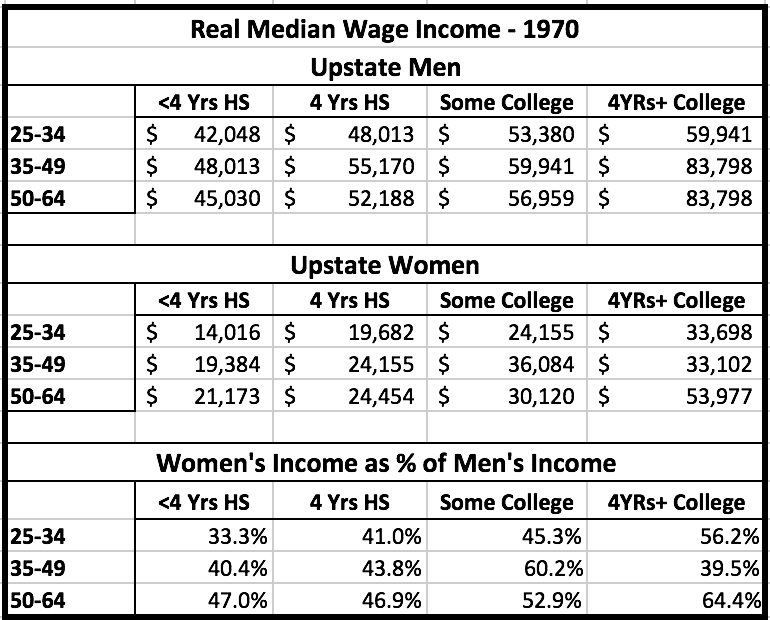 Income differentials between men and women upstate were near the national average of 44%. 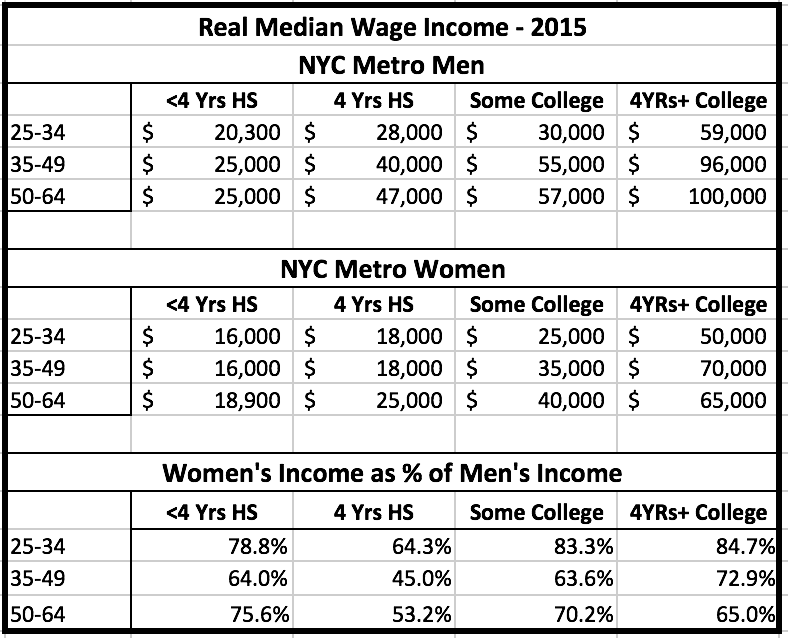 In the New York City metropolitan area, median wage incomes for women were higher, but were still only about 62% of those for men. This is particularly significant, because the data here only reflects those women who reported earning wages during the year. The lower median incomes of female wage earners were not related to the fact that less than half of women were in the labor force in that year. Male residents of the Rochester metropolitan area had the highest median incomes in 1970 – almost $60,000, which was substantially higher than the national median for men – $48,013. In that year, the real median real wage income of men in the New ‘York City metropolitan area – $48,000 – only exceeded that in the Utica-Rome metropolitan area – $46,820. For women, the picture was different – the real median income of women in the New York metropolitan areas was $29,500 – substantially higher than in any upstate metropolitan area or nationally. Here again, median wage incomes were strongly related to educational attainment, with college graduates earning at least 50% more than those with less than those who have less than four years of high school in most cases. For women, the differences in median wage incomes were even greater than for men — the median wage income of young women aged 25-34 was only $14,016, while that for those with 4 years of college was $33,698. Because the effect of education on women’s income was stronger than for men in 1970, women and men with less education generally had larger median income gaps than those with more education. But, even for women with four years of college, median incomes were substantially lower than for men – ranging from 40% to 60% of median male incomes at the same level of education. In the New York City metropolitan area, the same relationships were present. Women had wage incomes that were substantially lower than men, and less educated workers had much lower incomes than higher income workers. At all levels, the gap in incomes between men and women was smaller in the New York City metropolitan area than it was in upstate metropolitan areas. The difference between upstate metros and the New York City metropolitan area was particularly large for less educated women. Women with less than four years of high school in the New York City metropolitan area had 55% to 60% of the median income of men with the same level of education, while in upstate metropolitan areas ranged from 33% to 47% of men’s median incomes, depending upon age. For men, the picture was different – less educated male residents of upstate metropolitan areas had higher median incomes than those in the New York metropolitan area in 1970. For college educated men, incomes were similar. By 2015, the income gap between men and women was much smaller than in 1970, but was not gone. As in 1970, the income gap was smaller in the New York metropolitan area than it was in upstate metros. But, the gap between men’s and women’s incomes was much smaller in both regions. The median wage income for women upstate was 76.1% of the men’s median, while in New York City, the comparable percentage was 80%. Two upstate metropolitan areas had the same gender wage gap as the New York City metropolitan area – Albany-Schenectady-Troy and Binghamton. Though there has been progress in wage income equity since 1970, the progress has been uneven. In upstate New York metropolitan areas, women with four or more years of college education have come closest to achieving equity with men – attaining median incomes of between 70% and 80% of men’s median wage incomes. In contrast, women with less than four years of high school education have median wage incomes that are between 47% and 68% of men’s median incomes. 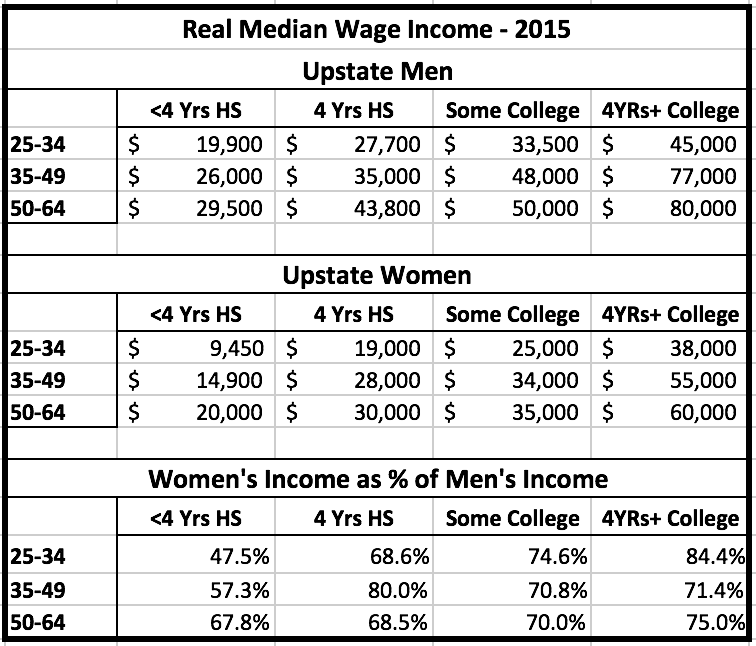 And, median incomes for young men and women with less than four years of high school in upstate metropolitan areas were very low in 2015- only $19,000 for men, and $9,450 for women under 35 years old. In 2015, for men under 35 in upstate metropolitan areas, the median wage income for those with four or more years of college was $45,000 compared with $19,000 for those with less than four years of high school. For women, the comparable numbers were $38,000 and $9,450. In the New York metropolitan area the median wage gap between women and men was 20% – the median wage income for women in the metropolitan area was $40,000 compared with $50,000 for men. For people with less than four years of high school, median wage incomes were more equal for men and women in the New York City metropolitan area in 2015 than they were in upstate metropolitan areas. High levels of education were associated with large wage premiums for both women and men – those with four or more years of college had median incomes that were at least three times those with less than four years of high school education for all age groups. The income gap between those with four years or more of college education and those with high school education or less has increased sharply since 1970. The difference between median incomes for men with a high school education or less was 60% less than for men with four or more years of college in 1970. By 2015, the gap had increased to 142%. 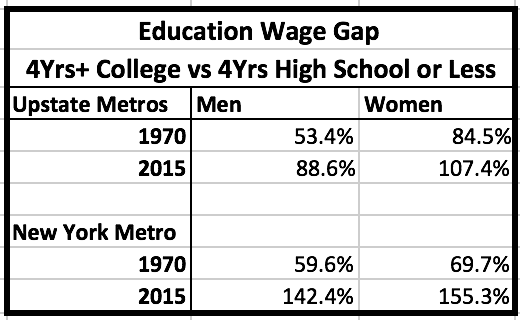 For women, the gap was 70% in 1970 and 155% in 2015. This increase in the wage gap reflects the greater inequality of incomes in our society in 2015 compared to 1970. Overall, the median wage gap between men and women decreased substantially between 1970 and 2015 – by 32% in upstate metropolitan areas and by 18% in the New York City metropolitan area. While the decrease in the New York city area was smaller than that upstate, the New York City had a smaller wage gap than upstate metros in 1970, and continued to have the smallest gap in the state in 2015. Upstate metropolitan areas and the New York metropolitan area also had smaller wage income gaps than the median for metropolitan areas nationally in 2015. 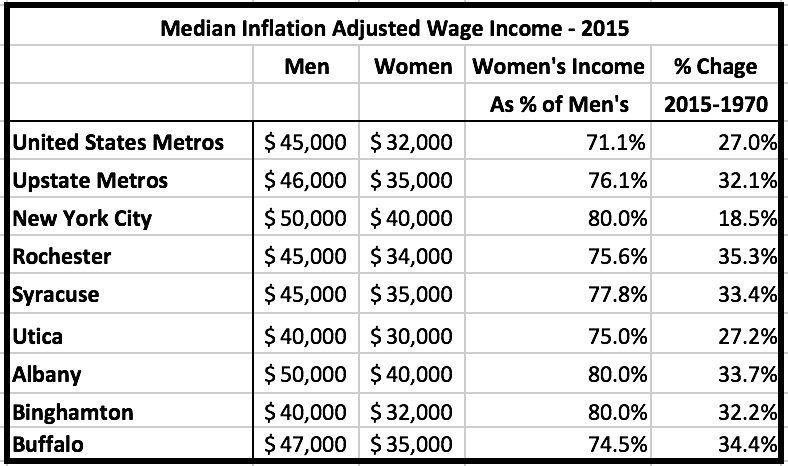 Nationally the difference between men’s and women’s median wage incomes was 29% in 2015. For the New York metropolitan area, the difference was 20%. Real median wage incomes have followed sharply different paths for men and women since 1970. In most metropolitan areas, men’s median wage incomes have declined. In a few, like Rochester, Binghamton, and Utica, the declines have been significant – 15% or more. For women, the path has been up. Median incomes for women were up sharply in 2015 compared with 1970. Nationally, and in upstate metropolitan areas, the increase was slightly more than 50%. In New York City, starting from a higher base in 1970, the increase was 35.5%. Women’s median wage incomes were far lower in 1970 than men’s, and the gains made by women have not been large enough to erase the wage gap that existed. In my earlier posts, I showed that inflation adjusted median incomes for people with less education were much lower in 2015 than they were in 1970. The median income for those with high school educations or less was 38% lower, compared to 21% lower for those with four years of college or more. In contrast, workers over fifty years old, at all educational levels had median incomes in 2015 that were close to those in 1970. 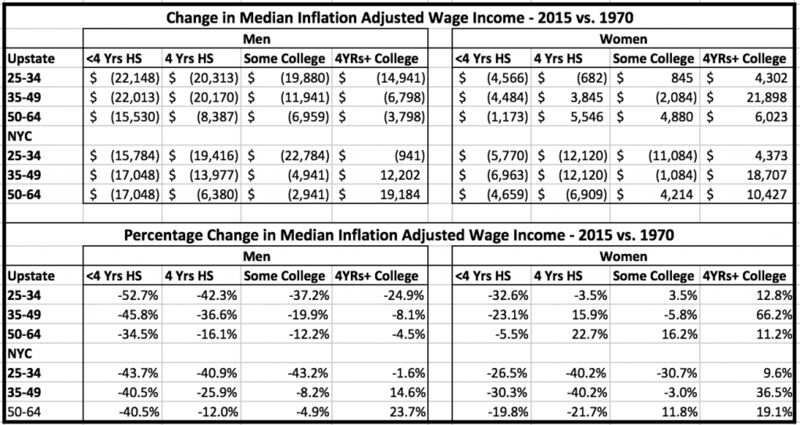 The table above shows the impact of education and age upon the difference in median wage incomes for men and women between 1970 and 2015. It shows that for both genders, young people have fared less well than older people and that less educated workers have fared worse than more educated workers. For young men, the decline in real median incomes between 1970 and 2015 is very troubling. Young people with less than four years of high school education had real median incomes in 2015 that were 44% lower in the New York metropolitan area than in 1970, while in upstate metropolitan areas, median incomes were 53% lower. The median income for men under 34 with some college experience was 37% lower in upstate metropolitan areas in 2015 than in 1970, while in the New York metropolitan area, the median real income was 43.2% lower in 2015. The median income for young workers with four or more years of college in upstate metropolitan areas was 24% lower in 2015 than 1970, while in the New York metropolitan area the decrease was 2%. The income premium for those with four or more years of college remained substantial for young men, but in upstate New York, median incomes, even for college educated young people were substantially lower in 2015 than in 1970. For less educated workers, the decline in median incomes extends to older workers as well, ranging from 35% to 45%, from 1970 to 2015. But, workers with four or more years of college aged 35 or older saw only small decreases in median incomes. In New York City, these workers had significant median income gains – 15% for those aged 35 to 49, and 24% for those from 50 to 64. Less educated women – particularly those with less than four years of high school were not immune to the declines in median real incomes between 1970 and 2015. losses ranged from 6% to 32%, and were not strongly related to age. In fact, the gains that this group made compared with men in wage income simply reflected the declines in real wage income were smaller for women with low levels of educational attainment than they were for men. In upstate metropolitan areas, women with four years of high school or more education had median income gains in most cases, with generally greater gains at higher educational levels. In the New York metropolitan area, however, women in most age groups who had less than four years of college had lower median incomes in 2015 than in 1970. The data points to the conclusion that but for the increase in the percentage of wage earners with four or more years of college, wage earners in metropolitan areas would have had much lower median wage incomes in 2015 than they did in 1970. Clearly, the labor market has substantially less demand for workers with limited educational backgrounds than it did in 1970. The erosion of median incomes of workers in the 25-34 year age group, especially in upstate metropolitan areas, should be of particular concern, because it may point to a long-term trend to lower wage incomes for workers who were in that age group in 2015. As the table above shows – the performance of median incomes for men and women aged 25-34 between 1970 and 2015 was substantially weaker than it was for older workers. The inflation adjusted median income of male workers between 35 and 64 in upstate metropolitan areas increased by 7.4%, while the median for those aged from 25-34 decreased by 29%. The median income of women between 35 and 64 in upstate metropolitan areas was 90% higher in 2015 than in 1970. For women aged 25-34 the increase was 40%. The narrowing of the wage gap between men and women is good news, although the fact that women’s median wage incomes continue to be lower than men’s is not. 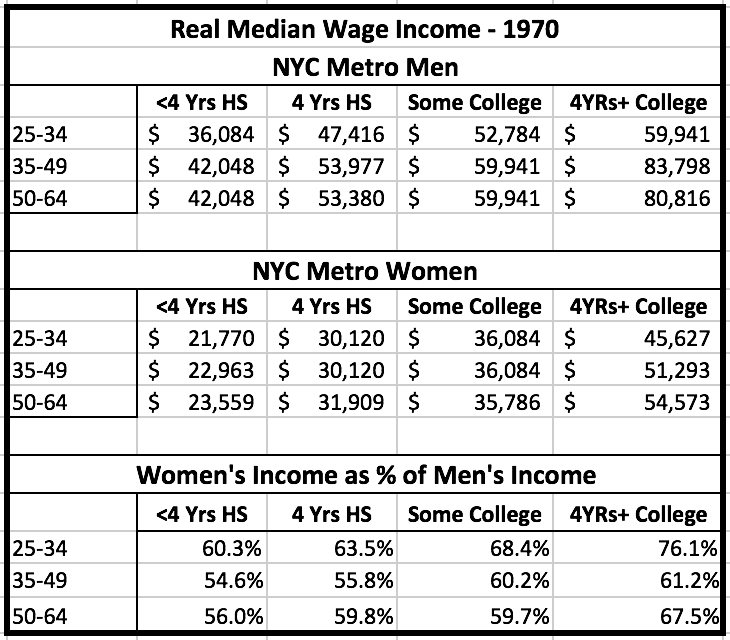 In 1970, the median wage income for women was less than half of men in upstate metropolitan areas, and about 60% of that for men in the New York metropolitan area. In 2015, the gap between median incomes for men and women was between 20% and 30% in upstate metros, and 20% in the New York metropolitan area. By controlling for education and age, the data shows that women with less educational attainment face larger income gaps than men, particularly upstate, where women with less than four years of high school earn between 48% and 68% of what comparably educated men in the same age groups earn. Even so, the gap between college educated men’s and women’s real incomes ranged from 15% to 35%. The data used in this analysis does not, in itself give explanations for the continuing wage gap. While the effect of age and educational levels are controlled for here, the analysis does not compare people with the same jobs in the same industries to determine the extent of differences between women’s and men’s incomes. If women participate more in lower paying occupations with similar educational qualifications than men, that could account for some of the difference in wage incomes. The data from this study is consistent with other studies that do compare incomes of men and women in the same occupations. 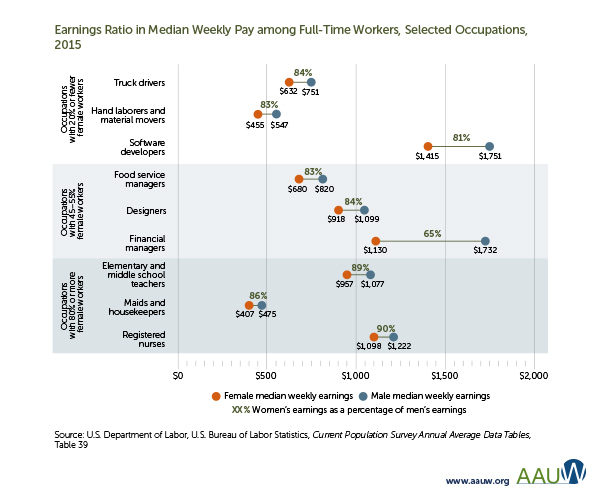 This chart, reprinted from “The Simple Truth about the Gender Pay Gap (Spring 2017), published by the American Association of University Women, shows that weekly earnings of men in the same occupations as women are ten to twenty percent higher than women’s. So, it is reasonable to ask, as in the case of the lower incomes of black/African-American workers, whether existing prohibitions against wage discrimination are being effectively enforced. It is important to note that discrimination may or may not be explicit and intentional – but may also reflect the relative absence of women in high level management positions who could offer the equivalent of “old boy networks” to help women get good jobs and higher pay. Thus, enforcement could be very difficult. The second major part of the solution, according to Lam is pay transparency. The Obama administration, in its last year proposed a regulation requiring “companies with 100 employees or more to report to the federal government how much they pay their employees broken down by race, gender, and ethnicity.” Unfortunately, this action was revoked by President Trump, in one of his first executive orders this year. Trump’s executive order also revokes other worker protections contained in Obama’s regulation. Men and women with four years of high school education or less have seen large decreases in median real income since 1970. The decrease is particularly severe for men with high school educations. Men with less than four years of high school saw median income losses between 1970 and 2015 of between 35% and 53%. Men under 50 years old lost between 26% and 42% of real income. Women under 50 years old lost between 23% and 33% of real income. In the New York metropolitan area, women with four years of high school lost between 22% and 40% of income. In metropolitan areas in upstate New York, median income declines for men under 35 with four years of college were less than half of the losses of people with less than four years of high school (25% vs 53%). Older men in upstate metros saw small income losses – 5% to 8%. Male residents of the New York metropolitan area saw gains in most cases, ranging from 15% to 24% for workers 35 years old or older. Women with four or more years of college saw significant income gains, ranging from 11% to 66%, but started from much lower income levels in 1970 than did men. The large real income losses of workers with low levels of educational attainment contrast with the better performance of median incomes for workers with more education. This is one cause of the greater income inequality that has developed in the United States since 1970. In earlier posts, I have described the loss of manufacturing employment in the rust belt, and its consequences for worker earnings. The loss of millions of manufacturing jobs in the rust belt has resulted in the substitution of jobs in service industries that are on the average lower paying. Unlike the manufacturing jobs that were lost, most service employment is not unionized, so workers have less negotiating power than more unionized manufacturing employees. The causes of manufacturing employment losses have been debated in the political arena, but most researchers have concluded, as I did here, that the great majority were victims of automation and process improvements, not imports. But both increased automation in manufacturing production and importation of manufactured products resulted from the desire of owners and managers of manufacturing businesses to cut costs to gain or retain market share in competitive marketplaces. Since labor has been a major element of manufactured product costs, the substitution of automation and lower cost foreign labor has been an attractive strategy to reduce costs. To date, service employment has continued to grow in the United States, in the rust belt, and in New York State. But, if anything, labor costs are a larger share of service industry costs than in manufacturing industries. As a result, high labor costs per service unit make local labor employment vulnerable to substitution by lower cost labor elsewhere or by automation. In many cases, services businesses have been unable to find substitutes for local labor that work well enough to prevent service employment growth, but in the future, technology may make more substitution possible. Government could play a positive role, by taking regulatory actions that help low income workers, such as increasing the minimum wage and facilitating union representation of employees. Though actions that increase labor costs might encourage substitution of automation or foreign labor for local labor, most studies show that the benefits of government assistance are likely to outweigh potential employment losses, as long as the actions do not dramatically increase unit costs. One of the more significant findings of this research was the disparate impact of real income decreases on workers under 35 years old. This problem was particularly pronounced for male workers, particularly those with high school educations or less. Overall, men between 25 and 34 had 21% lower real wage incomes in 2015 than they did in 1970. Young male workers in at all educational levels, except for those with four or more years of college, had median real incomes that were more than 40% lower overall than in 1970. The income losses extended to young women in the New York Metropolitan area, who also saw large real income losses compared with 1970. The finding in my research that the 25-34 year old age group in 2015 had much lower incomes than older workers leads to the conclusion that the trend towards increased lifetime income inequality noted in young age cohorts ending in 1983 by Guyvenen, Kaplan, et. al. is likely to continue. Options available to government to counter this negative trend could involve the Fed continuing to provide low federal fund rates, reducing the cost of borrowed capital, or stimulative federal fiscal policies that focus on things like infrastructure projects that could employ large numbers of construction workers, or increased income supports for low-income workers. However, stimulative monetary or fiscal policy could, if used to excess, lead to inflation that would in itself erode workers’ purchasing power. Robert Samuelson argues in “Trumps Low Growth Trap,” “We have entered a new era of low economic growth and high political disappointment. Our democratic system requires strong-enough economic growth to raise living standards and support activist government. These expectations, present in most advanced democracies, are no longer realistic, because the global economy has changed in ways that reduce growth…. President Trump’s argument that by implementing tax cuts and regulatory relief, economic growth would increase from the current rate of slightly over two percent to four percent is simply unrealistic, given the headwinds that it faces. And, anti-trade and immigration policies could actually slow economic growth. Greater income inequality threatens the existence of a large and secure middle class, and creates greater economic and social distress for those whose incomes are below the median. If the bottom half of the income distribution includes more people whose incomes are towards the extreme low-end of the income distribution, government will be faced with the choice of paying larger fiscal costs to support those whose wages are inadequate to provide a reasonably secure life, or of ignoring the needs of those who lack resources. Recent political history also shows that people who sense that their well-being is declining are vulnerable to political appeals based on resentment to “undeserving” beneficiaries of government assistance, and towards other factors, such as international trade or immigration, that may be portrayed as the primary causes of income declines, despite the fact that they are not. Reasonable policy options to counter the wage declines faced by less educated workers involve trade-offs like potentially increased inflation and greater substitution of automation and foreign labor for domestic workers. Approaches that address claimed causes like immigration and trade that have played at most a small role in the decreases in income will be ineffective and have potentially large negative consequences. As a result, they will increase cynicism beyond already high levels. Leaders should not argue that “magic bullet” solutions exist. Instead, they should promote reasonable expectations and acknowledge both benefits and costs.